Ski racks are one of those product categories that hasn’t seen a lot of change over the years. 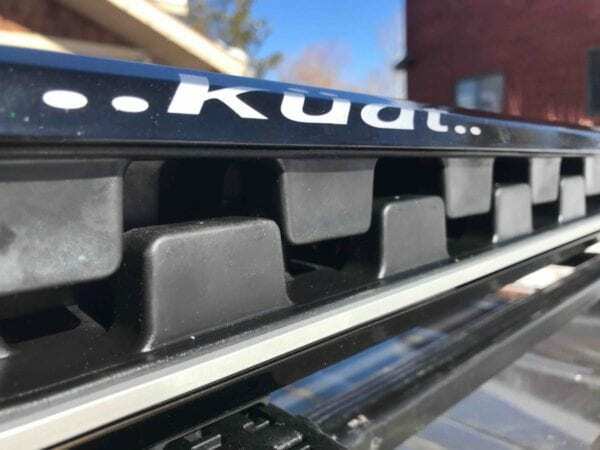 Kuat has recently come out with a new ski rack called the Kuat Grip Rack to address the stagnant updates in this product category. 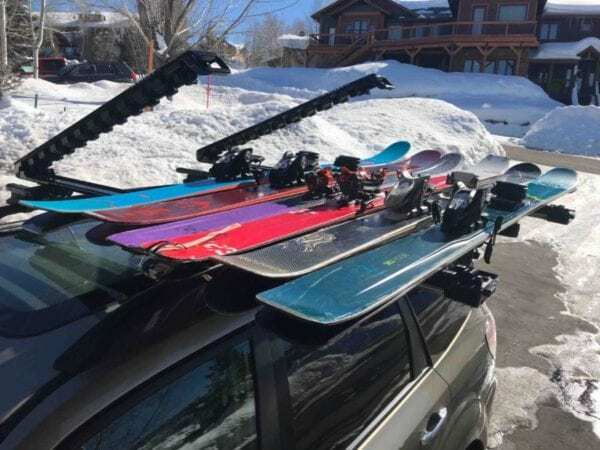 While Kuat could have followed suit of other ski racks on the market, they decided to throw out the old drawing plans and come up with something that is truly innovative for carrying skis and snowboards. 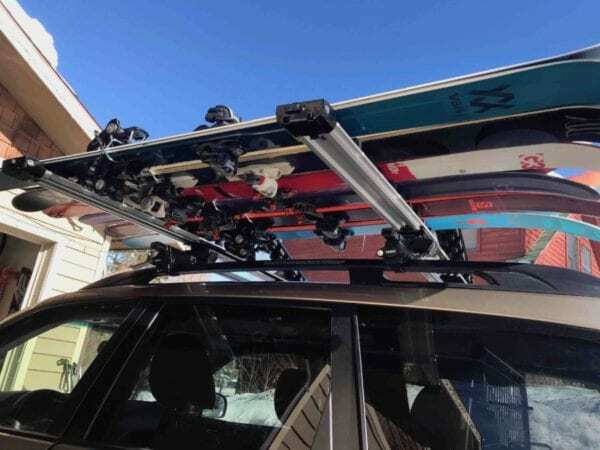 We often take for granted the design of a ski and snowboard rack, but it’s good to remind ourselves from time to time that these racks often carry hundreds and often thousands of dollars of outdoor gear. That said, it’s worth doing your research and getting a good rack, whether it’s for ski’s, snowboards, bikes, paddleboards, kayaks, etc. 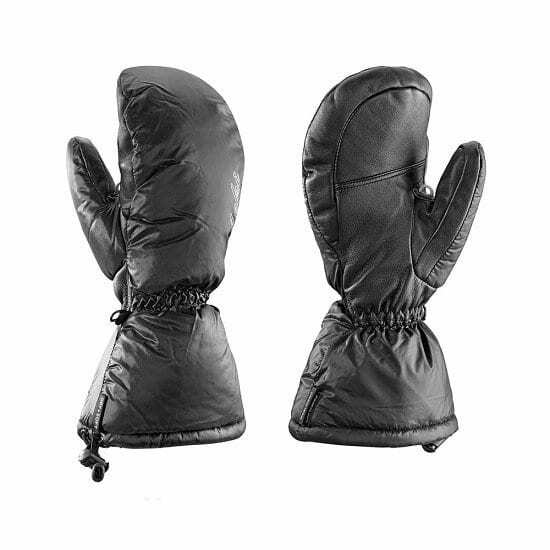 The Kuat Grip comes in a 4 ski ($349) and 6 ski ($398) capacity, or 2 and 4 snowboard capacity for those who ride. This capacity is not for 4 and 6 skinny all mountain skis, but this rack can accommodate wide power skis as well. There is a 160lb weight max for both the 4 and 6 ski capacity rack, but it will be hard to hit the max with 6 pairs of skis or 4 snowboards. I’ve been a fan of Kuat racks in the past in that the designers look at ALL aspects of their racks and see how they can make a product truly better and more user friendly. Kuat is not trying just to make a better widget(or product in this case), but in my opinion they are trying to be the best in vehicle racks. The there are a few features that really stood out to me in the Kuat Grip Rack. 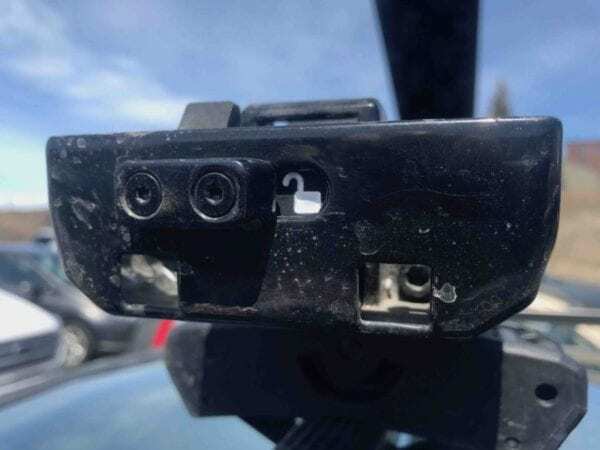 The most noticeable difference is the rubber teeth they use to clamp down on skis and snowboards to keep them in place when the rack is closed. 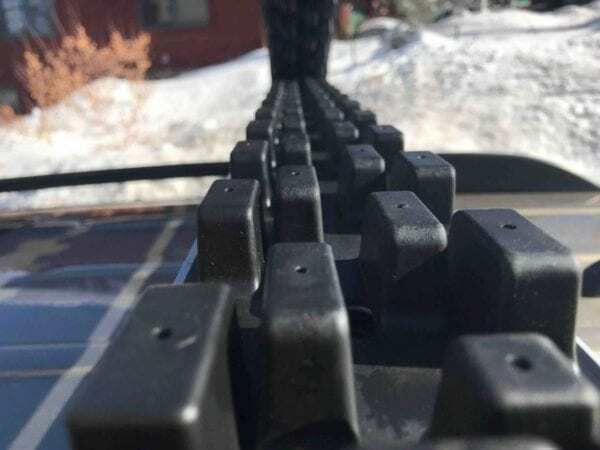 These teeth allow for each ski and snowboard to individually wrapped when closed vs other ski racks that have one long continuous piece of rubber that grips all the skis and snowboards on the rack. 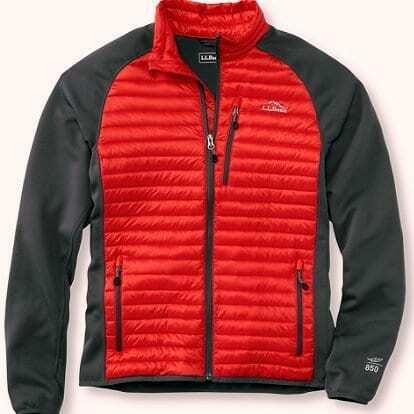 Lets say you have two larger snowboards and one skinnier pair of skis. The amount of vertical space the snowboards use on a rack can bow out the overall continuous rubber on on traditional rack, but the individual teeth allow for a more precise fit for each item in the rack. I’ve never run into a situation where I have skis or snowboards that don’t have a snug fit with a traditional continuous rubber rack, but this is how I see these teeth making coming into play. 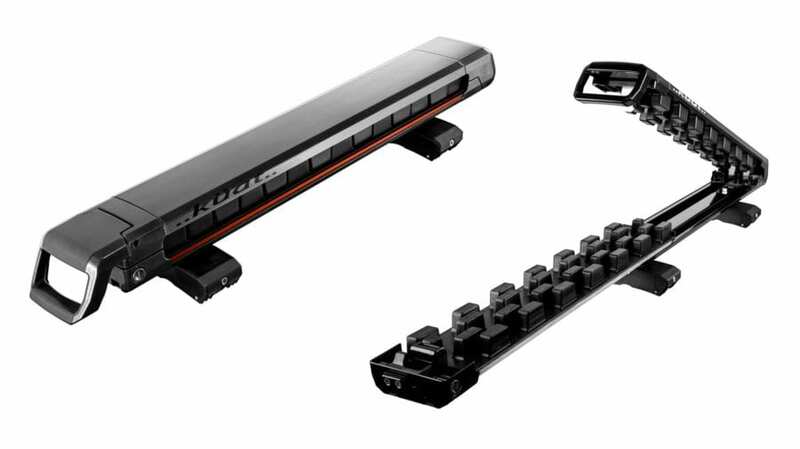 My Favorite feature on the Kuat Grip Rack is the sliding feature that allows you to pull the lower section of the rack out and load your skis and snowboards and push it back into place when everything is loaded. This is helpful when you have more than two pairs of skis and you need to utilize every inch of space on the rack, but have trouble reaching the far edges of the rack. With the slide, you can easily pull out the rack, load your skis on the far edge when in close to you when pulled out and then slide them back and and clamp down the rack. Being 6’0 tall and having longer arms, I am able to slide my skis all the way over without a lot of issues, but I still use this feature when I have a lot of skis as it’s just more convenient. For someone who is more vertically challenged, this feature is very helpful. I also find this feature helpful when my car is dirty winter driving and I don’t want to get my clothes all dirty by rubbing up against the car when reaching over to put the skis on the rack. There is one feature that is subtle, but is really nice to have. 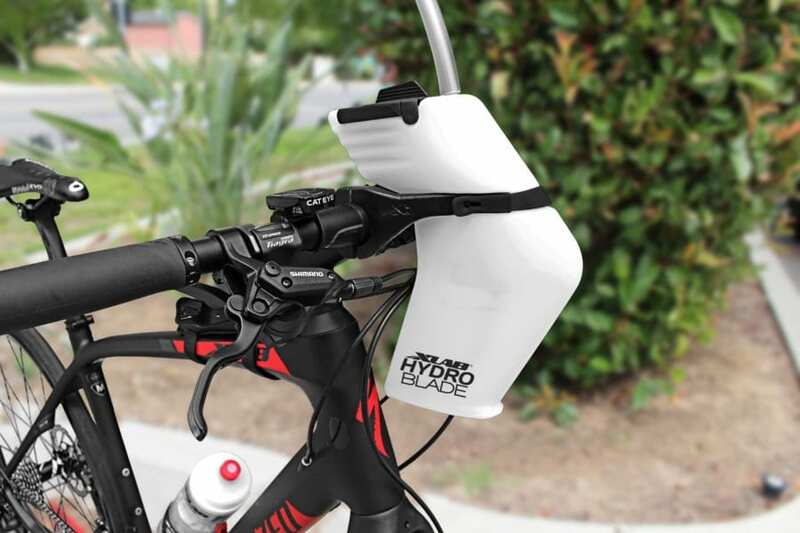 With most other racks, when you close the rack, you have the option to either use a key to lock the rack or you just let it be with chance of it opening while driving. There are tiny little locks in the Kuat grip that you can slide over when the rack is closed to secure your skis in place without using your key to lock the rack. 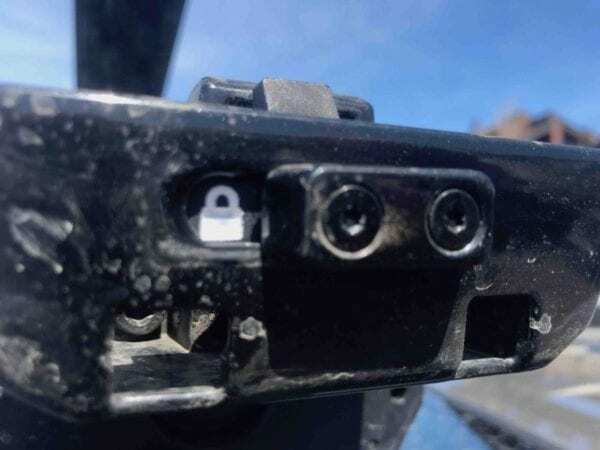 This is really nice when you are on the road and want the peace of mind knowing that your skis and snowboards stay put, but without having to hassle with a key. For those moments when you want your skis and snowboards locked up on the rack, there is also a key lock on each rack. Installing the Kuat Grip Racks is pretty easy. There is a minimum number of bolts and screw to use, so you don’t have to fret over an Ikea project here. I installed the Kuat Grip Racks on a older Thule set of square cross bars in about 15 minutes. There is a rubber strap that connects around bottom of the cross bars to the other side of the rack and it is pretty straight forward as how it attaches. The trickiest part of setting these racks up is knowing that in order for the sliding part of the rack to function correctly, you need to pull the slide out and insert a screw below the bottom slide. I say this is the trickiest part of the setup, but it really isn’t that difficult to figure out. All in all, the Kuat Grip Rack is pretty quick and easy to install on your cross bars. I set these racks up on a Subaru Forester and older squared Thule cross bars for reference purposes. If you have any questions on setup of the racks, feel free to leave a comment and I’m happy to answer any setup questions. I haven’t found a lot of downsides to the Kuat Grip Racks, but there are a couple things that can be brought up. First is the whistling noise when driving. I sometimes hear a whistling noise coming from the racks which mainly happens at speeds between 20-50mph. I’m not exactly sure on the cause of this whistle, but my first thought is air going through the teeth section of the rack. It hasn’t bothered me too much, so I’ve just let it be without trouble shooting the noise. Compared to other ski racks, I find the Kuat Grip rack to be a little boxier and less rounded. I don’t have a wind tunnel to test in, but I am curious to see if this creates a little more drag vs a rounded roof rack. I don’t have the answers on this one, but my assumption is that it causes a smidge more drag while driving and might cost you an extra 50 cents in gas through the ski season. As you can see, my downsides to the Kuat Grip Racks is pretty small and honestly doesn’t carry a lot of merit, meaning there are little to no major downsides.